Derbyshire Dales Councillor Peter Slack decided to support Wirksworth Swimming Pool through the sale of some of his garden produce. Following last December’s sales of Christmas trees, Councillor Slack spent the Spring and Summer months selling flowers and plants at Wirksworth Market, and has lately sold bulbs, raising a total amount of £1,300 which he has very kindly donated to Wirksworth Swimming Pool. 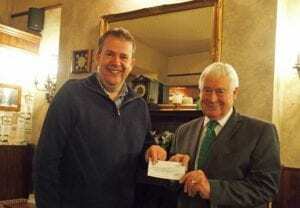 Councillor Slack met with Dave Baker, chair of the Wirkworth Swimming Pool trustees, to hand over a cheque for the money raised. Dave Baker comments: “It is very important for a self-financing charity such as Wirksworth Swimming Pool to have donations that can support the development and upkeep of the pool. Since taking over the management of the pool in 2012 every piece of the plant room has required replacement. Councillor Slack’s donation will cover the costs of replacing the swimming pool pumps, which required changing this summer”.